Marketing has reached out to new heights with the vast development in internet industry. New and effective tactics are followed to bring out the best out of a marketing campaign. It is really necessary to adopt the best marketing & branding strategy to promote your business rapidly. GetResponse and MadMimi are two of the most popular email marketing tools that can bring out the best from the business. These tools ensure that your customers turn to be lifelong customers and are informed about the latest updates about your business. Let us glare our eyes over these two fabulous tools and find out which one is best for your business. GetResponse is one of the magnificent leaders in email marketing industry that is serving thousands of businesses and helping them in branding & promotion through email marketing. In the modern era, GetResponse has become the lifeline of many businesses which are totally dependent on it for email promotion. Businesses can now keep their customers informed about the latest product launches, updates, and other important events through emails. Moreover, they have plenty of options to check how well the email newsletters are responding after being delivered to the clients. More than 350 templates are offered to the users to allow them to create the mesmerizing newsletters to attract customers towards their business. Customization has been made really easy with the WYSIWYG editor. Users can easily play with the template design and prepare it according to their choice. If you want to go social then there are options to provide links to Twitter, Facebook, and many other social profiles on your email newsletter. GetResponse comes with auto-responder system which is really beneficial in greeting the user as soon as he/she signs up the newsletter. It offers 1GB Image hosting space which is much greater when compared to other email marketing tools of same type. The performance of each and every newsletter can be tracked with ease. You also have an option to integrate it with Google Analytics to get accurate results. ‘SpamCop’ is the spam filtering tool of GetResponse that prevents the email newsletter from getting into the spam box of the client’s email. It checks the spammy words in the newsletter and suggests changes to the users for those words. 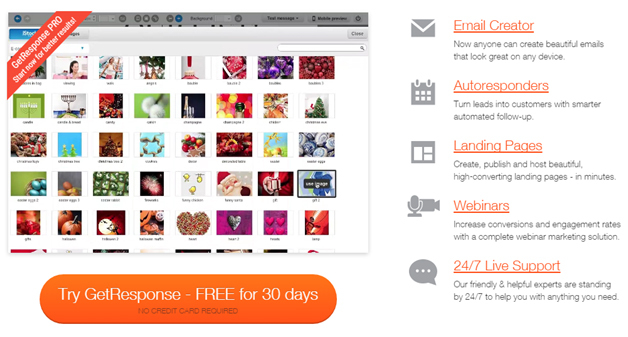 MadMimi is another player in email marketing industry that has thousands of customers connected with it. The company focuses on providing effective email marketing solution to the businesses and enhances their customer relationship. The appealing email templates will surely attract the eyes of readers. You can ask them about the phone support, no matter wherever you are throughout the world. MadMimi customer support is just awesome and technically sound too. Some of the top notch features of this awesome tool are listed below. You can have an eye over these features. MadMimi provides an exclusive range of over 100 templates to choose from. 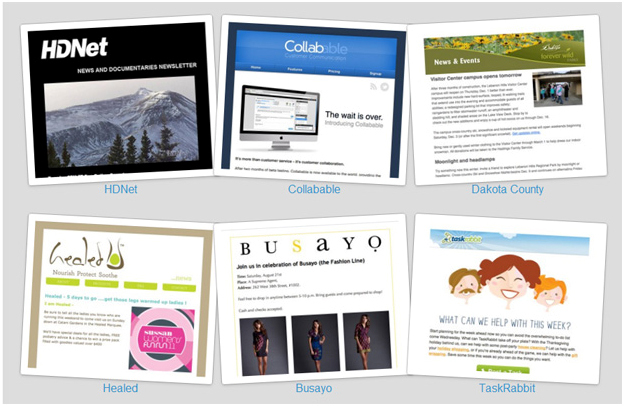 These templates are appealing to be added in your newsletter format. All the templates can be customized with the help of WYSIWYG drag and drop editor so that attractiveness can be added according to user requirement. Social media integration options like Digg, Twitter, Facebook, and many others can be added to your newsletters. You can great the newly signed in user with a preset welcome note with the help of MadMimi’s auto-responder system. Though, there is no spam checker tool available with MadMimi, but human readers are provided to check the text of your newsletter to check words that might be blocked by spam filter of email of your clients. You can check how these newsletters are performing by the performance reports provided to you by this tool. You can integrate Google Analytics too to get more accurate results. 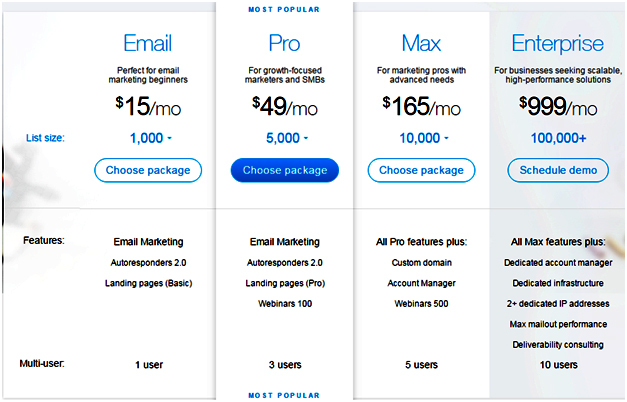 At GetResponse, the minimum package starts at 15$ per month for a list of 1000 subscribers. You can extend the package whenever your list grows. 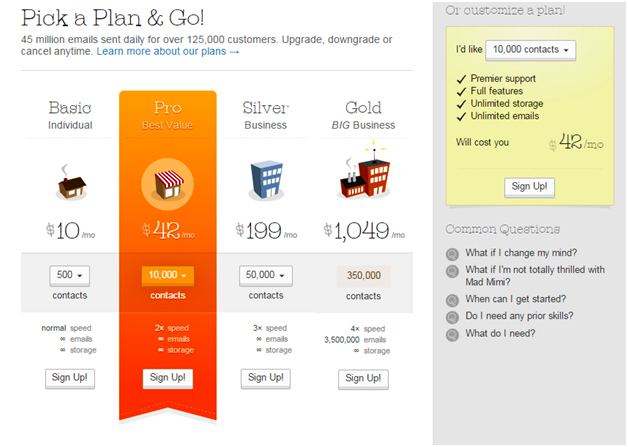 At MadMimi, the minimum plan starts at 10$ per month for 500 contacts. You can easily increase you plan once your contacts start growing. Templates: GetResponse is offering more than 350 customizable templates to its users, while MadMimi is offering just around 100 templates. So, the user gets more choices of templates at GetResponse, but is restricted to just 100 templates at MadMimi. Spam Tool: GetResponse has ‘SpamCop’ as its own spam filtering tool which checks the newsletters and find out words that might be blocked by spam filter of your client’s mailbox. But, MadMimi lacks spam tool, but have human readers to find spammy words. The software cannot go wrong in catching the spammy words, but human readers may fail to catch all spammy words. GetResponse is surely a better tool as compared to MadMimi over some features. GetResponse has exclusive range of templates and has its own spam filter too, but on other hand, MadMimi lacks high number of templates restricting the users to few choices. Also, MadMimi do not have any spam checker tool rather it has human readers to find spammy words.